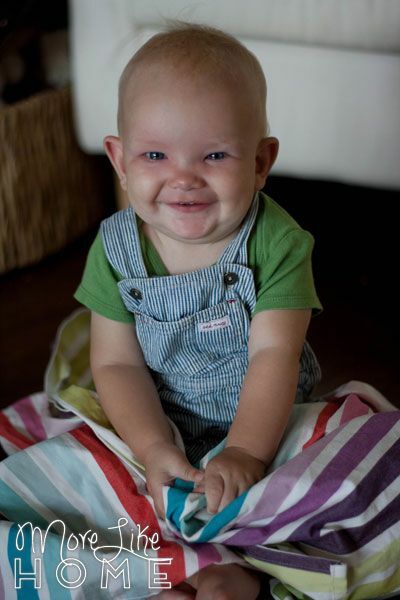 Getting things done with a baby in the house can be hard. 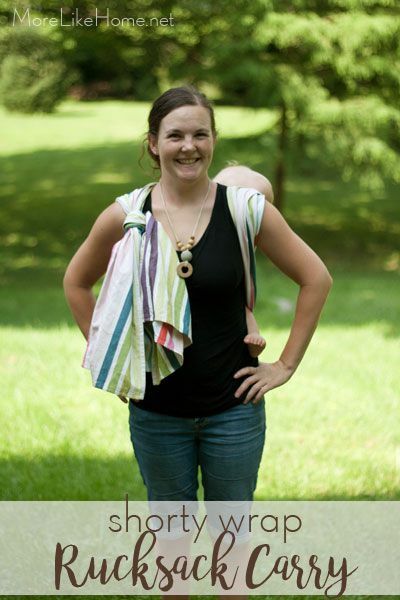 Which is one of the reasons babywearing can be a life-saver! 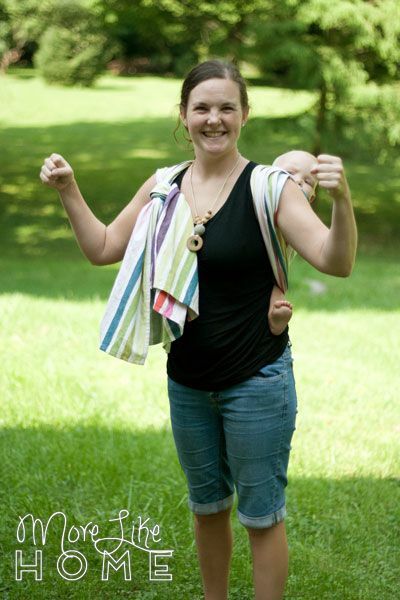 This summer in an attempt to beat the heat I tried out a new lighter, cooler baby carrier - the shorty wrap! I love my homemade ring sling and stretchy wraps for a newborn, but with a hefty 9 month old I've moved into more supportive waters. 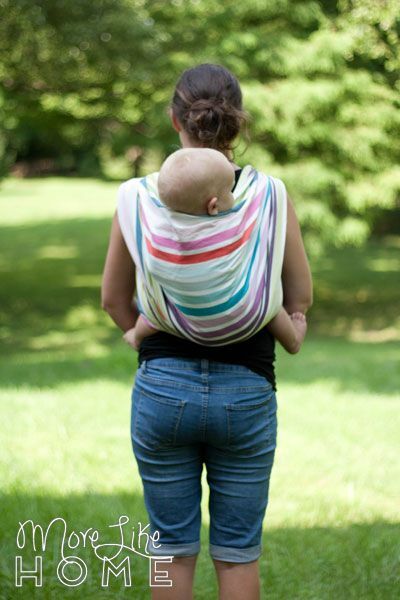 I've made a couple Mei Tai carriers that I haven't reached for lately (the ease-of-use is great, but I'm planning to make one with wider straps to see if I can get it a bit more comfy). So that has left me falling more in love with woven wraps. And it probably helps that Husband got me the wrap I've been dreaming of for my birthday last year. But both the dream wrap and my homemade wrap are pretty long (a size 5 and a size 7) and require several passes. More passes = more layers = more heat. So when I started thinking about something cooler for summer, a shorty seemed like it was worth a try! 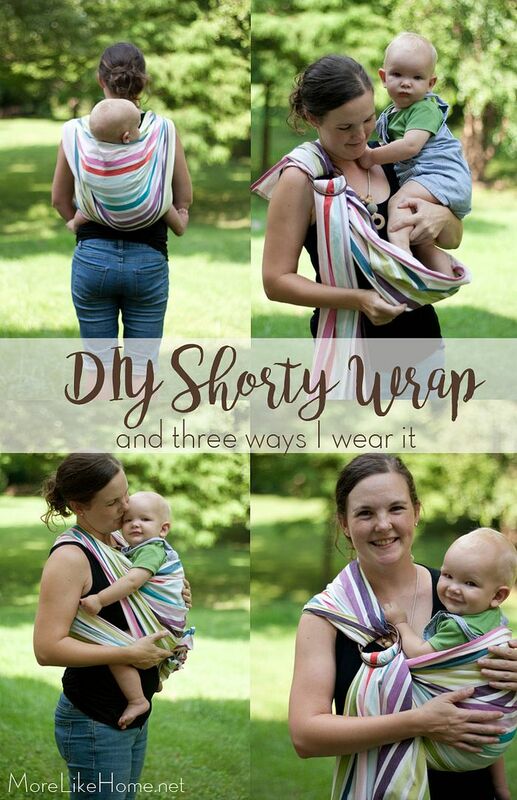 A "shorty" is woven wrap that is... short. Ha. Size 4 or shorter. The one I made is only a size 2 (more info on wrap sizing here). I've actually made one shorty before using a $6 tablecloth (tutorial here) but I didn't really know how to use it and gave up pretty quickly. But a couple months ago I came across the shorty carry tutorials by Wrap You in Love, and the whole shorty world opened up before me. So far I've mostly been doing a ruck back carry with a ring finish, but I've also used it for kangaroo carry and a no-sew ring sling in a pinch. A shorty is quick to wrap up and the short tails were great at the beach so I wasn't dragging my wrap through the sand when I put him up and down. 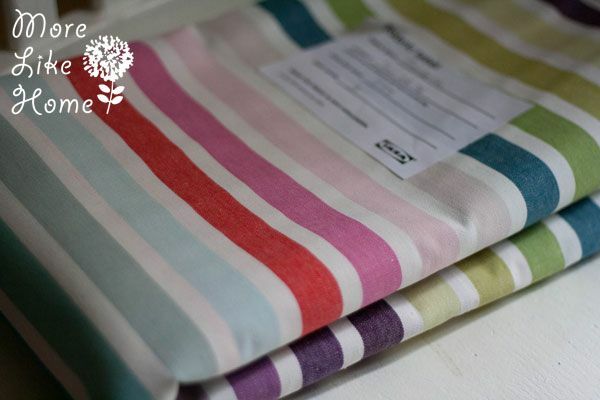 Plus the colorful stripes feel fresh and summery! Be careful when buying your fabric. 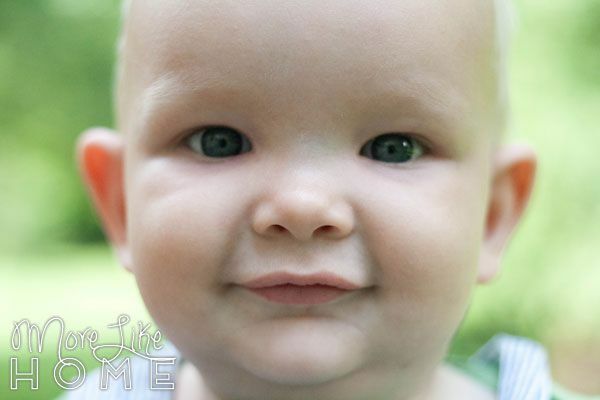 You need something strong enough to support you baby, but not so thick it's difficult to get a snug wrap. Quilting weight fabric is NOT strong enough. Hobby Lobby duck cloth works well, and Ikea has a few good choices. 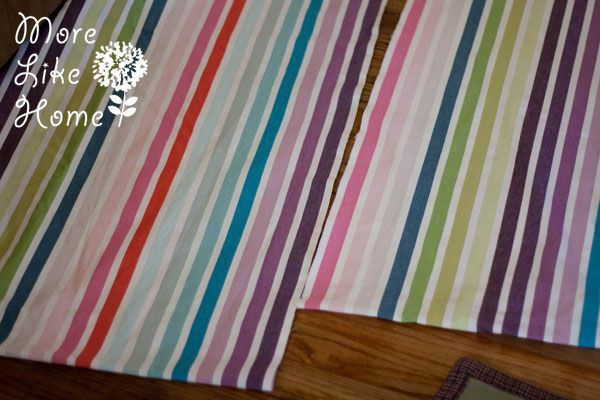 There are some tablecloths that work really well, too - look for one that's all cotton, 120" long, and not too thin (you're a more limited on size and it would be hard to find one longer than a size 2, but they can be really affordable. More info on tablecloths at the end of the post). 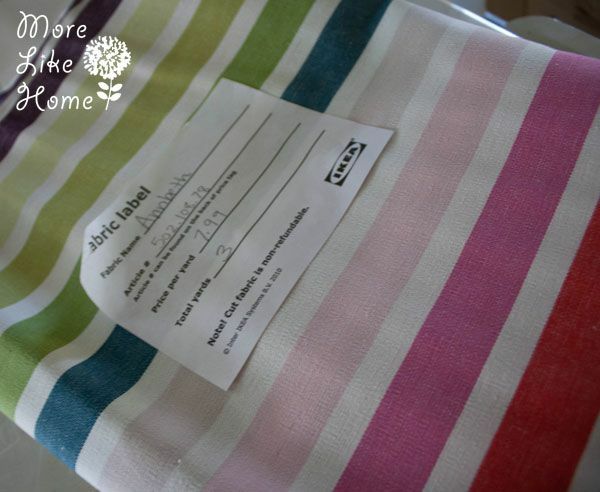 I've also found a good linen at Joann Fabric that I used for my ring sling. I try to look for reversible fabrics that have the pattern on both sides, but they are a little harder to come by. For this shorty I used 3 yards of Ikea Annbeth fabric that I bought for $7.99/yard a couple years ago (I checked the website and it looks like it's been discontinued). 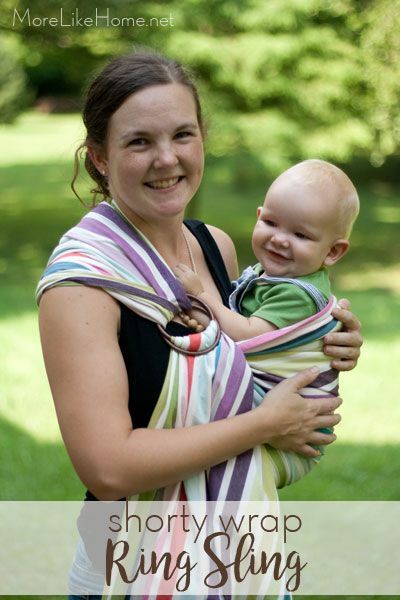 So we're looking at just $24 for this wrap, plus we'll only be using half the 60" width so we can get two wraps, or a wrap and a ring sling out of it! To make your shorty wrap, cut the fabric 30" wide (if it's 60" wide just cut it right in half). Hem the long edges. Fold each edge under 1/4", then 1/4" again and sew along the folded edge. 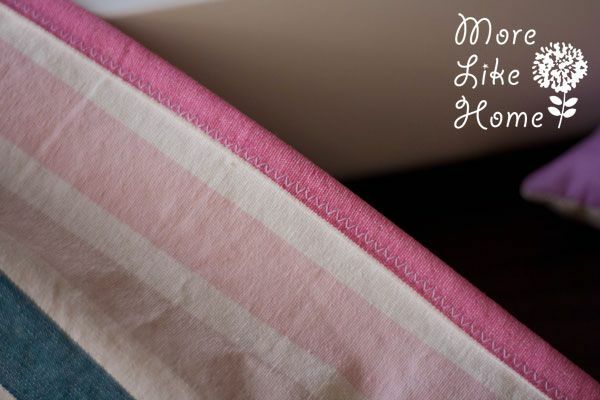 One tip I've read is that you can sew one edge with a straight stitch and the other with a zig zag to help tell them apart when you are wrapping. Or use a different color thread on each side. But with my wrap 1 edge is on a pink stripe and one is on purple so I can tell them apart anyway. Then hem the short ends. If you have a few extra inches of length you can cut the end of at a shallow angle to make a tapered end. To make tapers, on the left end measure in 6-10" on the top rail and draw a line from that point to the end of the wrap on the bottom rail. On the right end measure in 6-10"" on the bottom rail and draw a line connecting that to the end of the wrap on the top rail. 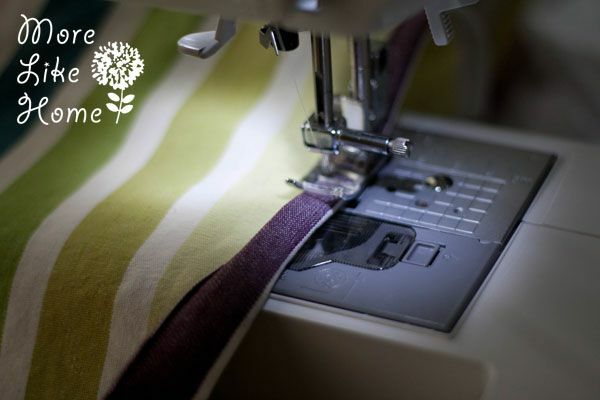 Cut along those angled lines and hem. When you're done your wrap should look like a parallelogram, not a trapezoid. This /===/, not this /===\. I prefer tapers because they hang prettier when the wrap is tied, but my wrap ended up sooo short I couldn't spare then inches so I went with straight ends. Now wrap it up! Start with one willing/tearful participant. Either one should work. My favorite has been the rucksack carry (she has tons of variations in her shorty archives) It's so much easier to work on things with him on my back! I've found I really like using rings to finish off carries with a shorty rather than wrestling with the short tails. (I use a single medium size ring for front & back carries, and two large rings for a ring sling) It took a little practice to get the hang of it, but now I can get him up pretty quick! Kangaroo carry is the only front carry I know of for such a short wrap. We don't use it too often (he's mostly on my back) but it's a great go-to option for a tinier baby who can't swing a back carry yet. The other way I've used it is as a no-sew ring sling. I love the ring sling option when I need to get him up and down a lot (like in and out of a few stores running errands). 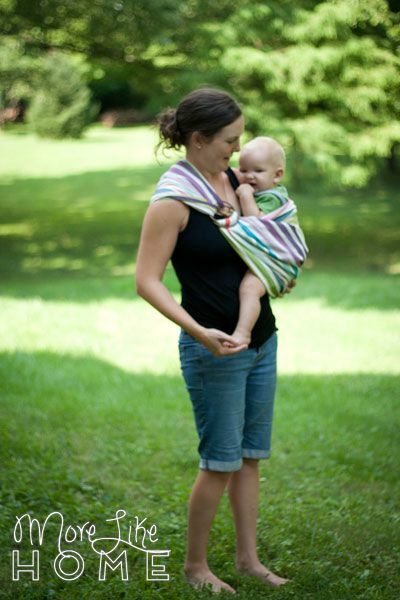 And letting your shorty double as your ring sling means one less carrier to buy/make! If you don't like a long tail hanging down, you can wrap it around and tuck it in behind baby. This wrap has been so handy this summer. I want to make a second one to keep in the car with a set of rings. That way I'll never be caught without at least a few carrier options! It's the perfect size to fill a few other rolls, too. We've used it as a park blanket, nursing cover, and a car blanket. p.s. I spent our little photo shoot going "What do I do with my hands? Is this weird?" until I finally decided to go with the Jack Donaghy coffee-cup-in-each-hand technique. Ah yes. This feels much more natural. Our littlest boy is loving the shorty, too. He fell asleep in it again this morning while we were catching grasshoppers in the backyard. While I like the ease and coolness of this wrap, if i was going to be wearing for a long time (like a couple hours hiking or shopping) I would go with a longer wrap with a torso pass to help spread out the weight. If you've never wrapped before, start with a longer wrap like a size 6. If I make another size 2 I'll go a little longer so I can have tapered ends. Even and extra foot (6" more for each tail) would be great. But next time I'll probably go a bit longer than that even, because a size 3 would mean Husband could use it, too. At this size it's too short for him to even get the ends together. Mahogany tablecloths are really popular for shorty wraps and ring slings. They are a great thickness and really pretty, but they aren't very cheap at around $50/tablecloth. You can get two shorties out of it which comes in at just $25/wrap so it's still not a terrible deal, especially compared to the price of purchasing one from a wrap company! Plus their woven and jacquard tablecloths are reversible (vs. printed tablecloths which are one-sided). Some of my favorites are the Tree of Life, Jaisalmer Jacquard, Ralph Plaid, and Cobble Stone, and the Timothy Plaid seems like a sweet Christmas photo wrap with all that red and green. Target also has some great tablecloths, but not all are suitable so you'd probably need to feel them out in person to choose. And don't forget, if it's getting a chilly you can add a babywearing insert to your favorite jacket to keep you and baby both toasty, even in a shorty wrap! 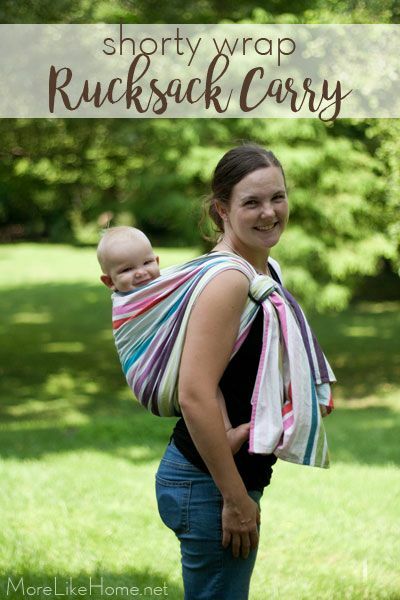 Have you tried making a baby carrier yet? Ever tried a shorty? What's your favorite kind of carrier?